Serial Scoop: Are the Powerful, Self-Assured Women on 'The Young and the Restless' At Risk for Extinction? Are the Powerful, Self-Assured Women on 'The Young and the Restless' At Risk for Extinction? Are the Powerful, Self-Assured Women on The Young and the Restless At Risk for Extinction? Having watched The Young and the Restless for many years, one of the things I loved about it was the preponderance of female movers and shakers found in Genoa City. Along with the drama they brought to their storylines, these women illustrated the era of gender equality in every aspect of their lives. 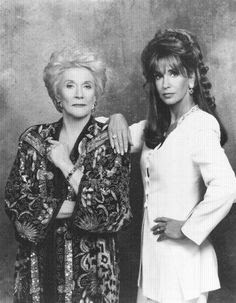 Starting right at the top, Katherine Chancellor (played by the incomparable, and still missed and admired, Jeanne Cooper), was the CEO of Chancellor Industries, alongside her pseudo-daughter, and sparring partner, Jill Abbott (played by Jess Walton). This was a position rarely found in the real world canvas. Both Katherine and Jill led Genoa City’s wide community of women holding powerful positions in all the companies throughout their city. Y&R women held high level, executive positions in the show’s core companies, Newman Enterprises and Jabot. These familiar faces include Victoria Newman, Ashley Abbott, and Phyllis Abbott (played by Amelia Heinle, Eileen Davidson, and Gina Tognoni respectively), to name a few. Each of these women, at one time or another, were CEO’s or heads of large departments in the conglomerates they worked for. For some reason, the current writers have taken an unfortunate change in direction. There has been a noticeable reduction of female characters holding high level positions. While some are relegated to second and third tier executives, others have completely fallen off the executive grid. Too many women in Genoa City have become the woman behind the man. want to see on Y&R. I must admit, I’m glad to see the character, Phyllis Abbott, reclaiming some control by scheming to usurp the upper hand in a surreptitious battle against the great Victor Newman (played by Eric Braeden). It offers hope for the destiny of women in Genoa City’s business and industry. However, for the time being, all the above named female power-players in GC have since been relegated to significantly reduced business responsibilities. Ashley Abbott is a role model for female fans. I hope Y&R will find their way to rebuilding the strong women who, despite their flaws (it’s a soap opera—every character has numerous flaws), are able to inspire viewers, particularly female viewers, with their ability to hold the highest level executive positions in well-respected companies, while also managing to maintain rich, fulfilling, and exciting personal lives. Despite their shortcomings, characters such as Ashley Abbott and Victoria Newman are role models for female fans. It would be great to see them receive equal status and respect in the GC business world once again.